Do you have a timeline explaining the infancy narratives of Matthew and Luke? 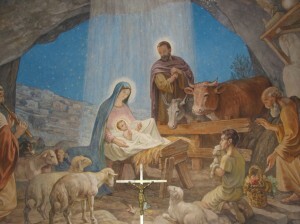 How does the Luke account of the infant in a manger square with Matthews account of the magi visiting a child in a house? Is there a gap of time or a change in venue? I have heard that the Magi visit a year after His birth. I heard you on Relevant Radio approximately a week ago on the topic of whether the Wise Men met the Shepherds. I checked out your web site and enjoyed your article. Previously I had typically thought that they had come later – perhaps as much as two years later given the fact that Herod order the slaughter of all boys two years of age or younger. We all know, however, of Herod’s character, and he very likely would have killed all boys 5 or under if there had been as much as two years. Nonetheless, we cannot have the Wise Men arrive in Bethlehem prior to the expiration of the forty days necessary for Mary’s purification, Luke 2: 22, and the whole story of Simeon and Anna. Undoubtedly Herod’s slaughter of the infants and the holy family’s flight into Egypt took place very soon after the arrival of the Wise Men in Jerusalem, probably within days. Hence I am forced to conclude that the Wise Men probably did not meet the shepherds unless they stayed in the vicinity for over forty days. I guess this is just one of those questions that will have to wait on a definitive answer until we get to Heaven and can ask one of the shepherds or Wise Men. Near the bottom of page 5 you discuss the differing perspectives of Matthew and Luke. I agree in every respect except for your statement that: “And while the genealogy provided by Matthew relates to Joseph’s ancestry, some scholars have considered the genealogy recorded in Luke to be Mary’s family tree.” Both genealogies are of Joseph. “Names in the families of Israel were reckoned either according to nature or law: by nature in the case of genuine offspring; by law when another man fathered children in the name of a brother who had died childless. (See Deut. 25: 5-6) Since no clear hope of the resurrection had as yet been given, they depicted the future promise by a mortal “resurrection” so that the name of the deceased might survive. These genealogies, then include some who succeeded their actual fathers and others who were children of one father but were recorded as children of another. Thus both the memories of the actual and the nominal fathers were preserved. Hence neither of the Gospels is in error, since they take both nature and law into account. For the two families – one descended from Solomon and the other from Nathan – were so interconnected through the remarriage of childless widows and the “resurrections” of offspring that the same persons could correctly be deemed as children of different parents at different times – sometimes of reputed fathers, sometimes of actual. Both accounts are therefore accurate, though complicated, as they bring the line down to Joseph. “To clarify, I will explain the relationship of the families. Reckoning the generations from David through Solomon [as does Matthew 1: 15-16], the third from the end is Matthan, whose son was Jacob, the father of Joseph. But if we follow Luke [3: 23-37] and reckon from Nathan, the son of David, the corresponding third from the end is Melchi, whose son was Heli, the father of Joseph. It must therefore be shown how both Heli and Jacob can be fathers to Joseph, and both Matthan and Melchi, belonging to two different families, were grandfathers. I learned this fascinating story at a seminar some years ago given by Dr. Maier. It is so beautiful and factual that I just had to share it with you. Thank You And The Lord Bless You All.